Once registered in the social network vk.com, man hopes to communicate. To his friends learned, We need to understand, how to add a contact photo, whether Avatar, an album or a photo on the wall. Currently, the photo on the avatar will accelerate the emergence of a tape of familiar friends, or colleagues. To set the photo on the avatar just click on the camera image on a personal page, or on the icon to “Put photo”. Deciding to take advantage of fresh photos from your computer, in the opened window, download press left click on “Choose photo”. Before you open the root directory, choose the address of the photo and click “Save”. The fastest way to add the real photo on avatar – to do it with a webcam. possible, if when loading photo from your computer, (Claim 2 cm), the user selects the button “create snapshot picture”. Left on your page click on “My photos”. Now look at the upper right corner of the screen. Under the button “Exit” is a command “Create album”. Click on it, enter a name, description, (not necessary, but it is desirable). Press the “Create”button. Getting to upload photos. Each can be placed in an album, click on the camera icon, In the new interface. Photos from your computer and download, as an avatar, choose an address, click on the “Save”button. If desired,, add a description and click “Save”. To add photos to an existing album, from the main page of your account go to “My photos”. You choose where interest album. At the bottom of the page with the uncovering of the preview pictures to see the camera icon. Click on it, and upload photos. Consider the, that when you add photos to an album not, and when you click on the button “Add new photos”, the image will appear on your wall, but will not be stored in albums. To find out how to contact to add a photo on the wall, need on the wall of his visual page, or put another page for writing courses in the field. This is done by clicking the left mouse button. Drag a photo from your computer in a message box, holding his arm. Look down the message box. Press “Attach”. In the opened window is possible to insert a photo from an album vk.com, or download it from your computer. If the photo on the wall is not added, it means, that the owner of the page to add restricted materials on your wall posts. If this is your wall, then go to profile settings and it reconcile this issue. How to contact to add a photo to a message? Open man page, who are planning to send a media file. Click under the avatar on the button “Send message”. In the window that opens, below the line of the message click on “Attach”. You choose a photo from your albums, or click on the button “Download”. Post photos from your computer. 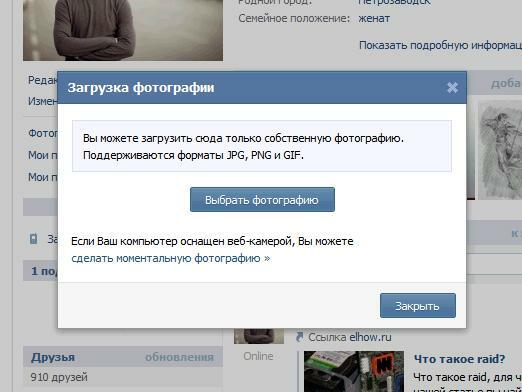 Over time you will understand, that social network vk.com no big deal, especially in the matter, how to add a contact photo. How to make a group from Contacts?